​IBM to buy Red Hat. Who said Elephants can't dance (again)? On October 28, 2018, IBM announced that it has reached a definitive agreement to buy Red Hat, the open source software solutions provider, in a $34bn all-cash takeover. The deal is IBM’s largest acquisition in its 107-year history and represents Ginni Rometty’s (Chairman and CEO) strategic gamble to reboot the historic tech giant. 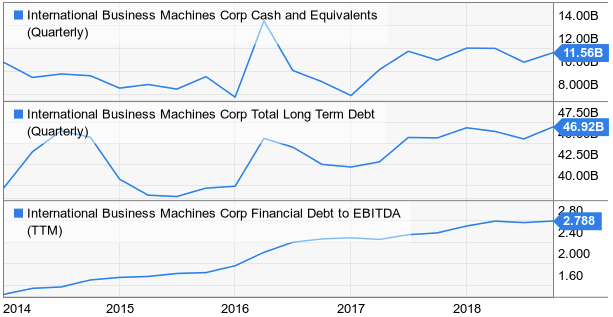 This big bet comes after many years of revenue contraction for IBM, while maintaining a rewarding financial strategy for shareholders - high dividends and steady buybacks. Despite this, IBM’s stocks have fallen over 30% since November 2013, with its core tech services that are struggling to keep the pace of the new technological wave. For these reasons, the 60% premium that Big Blue has agreed to pay to Red Hat shareholders is aimed to reposition the company for the cloud computing era that has to come. On the other hand, Red Hat, rose as a Linux-based company, is a provider of open source software solutions, that develops and offers operating system, virtualization, management, middleware, mobile and storage technologies, using a community-powered approach. But more importantly, the “game-changer” that IBM is seeking is Red Hat’s hybrid cloud business, that is a cloud computing environment where clients can move their workloads between private and public clouds, giving to companies a greater flexibility and more data deployment options. Similarly to the Big Blue’ s rescue operated about 25 years ago by her predecessor Lou Gerstner, who moved the company’s core business towards IT services, Ms. Rometty’s plan is to reshuffle IBM’s cards and take the company back to its glory. Therefore, since the start of the new century, companies have started to store and to move their workloads on centralized cloud systems (mainly provided by Amazon, Microsoft and Google), a growing business in which IBM has never played a dominant role. However, although the cloud computing market is expected to more than double before 2021, today’s challenge for software providers is changing. Rometty believes that customers are now looking for new solutions to integrate these cloud systems with their existing data centers, that represent massive sunk costs. This rigid structure is overcome by the hybrid cloud solution, a market led by Red Hat that thanks to his open source service is also able to save companies from the so called “lock-in trap”, or rather the tendency of becoming overly dependent on one single tech company. In other words, Ginni Rometty is trying to overcome the mistakes made after the crisis, where IBM has not been able to effectively compete in the cloud business, by entering that market in an alternative and more promising way. Indeed, trying to compete against Amazon Web Services and Microsoft Azure, which hold respectively 41.5% and 29.4% of the cloud market, makes no sense in a business where retention is all. For this reason, IBM’s goal is to ride this new wave of innovation with Red Hat, by offering its costumers services to better integrate their different storages. IBM will acquire 100% of Red Hat issued and outstanding common shares at a price per share of $190, that represents a 60% premium to the price before the announcements. IBM’s bid values the company at $34bn, resulting in a 9x Red Hat’s expected revenues multiple, in line with recent software transactions, and a 33x EBITDA multiple, compared to the huge industry median of 88x. As Ginni Rometty said, the deal will result in growth synergies, and predictions from an RBC analysis estimate an increase in earnings per share of $1.20, from $13.80 to $15. On the other hand, the deal will be highly financed through debt with an expected financing cost of 1$ per share and it will force IBM to stop its buyback program for 2020 and 2021. Will the Big Blue elephant be able to dance again? As Louis Gerstner (IBM CEO from 1993 to 2002), demonstrated in his book this is feasible, but many analysts doubt that the risky all-in that Ms. Rometty has placed on Red Hat will be rewarding. First of all, the Linux focused company’ s products are open source, which implies that the code can be taken for free, and so that the real core business of Red Hat is helping and supporting clients in their tech innovations, rather than the software its self. This implicates that IBM is not buying software but Red Hat’s people and “people can walk”. ccording to internal sources many are already planning to leave given the strong cultural discrepancy between the two companies. In addition, with the takeover IBM is not increasing its client base, but instead it is running the risk that some Red Hat costumers will quit, given their adversity or rivalry against IBM. ​Finally, many concerns have been raised over the debt that IBM will need to finance the deal. By doing some simple estimations, we can easily expect an issued debt of at least $24bn - given that Big Blue’s cash reserves are currently at $10bn - that would result in a new total debt of $71bn, a monster amount for a company that is already struggling. In this reasonable scenario, IBM would be forced to pay down its debt with all the cash that the company will generate, putting a strong pressure over the integration of Red Hat. The deal is expected to close in the second half of 2019, following Red Hat shareholders and regulatory approvals. However, the high risk that IBM is riding and investors’ concerns about the closing of the deal are reflected in the price of Red Hat shares that are currently trading at $178, 6.3% lower than the bid price. Throughout the mega takeover, IBM is advised by Lazard, Goldman Sachs and JPMorgan Chase, while Red Hat advisors are Guggenheim Partners and Morgan Stanley.